St. Patrick’s Day is nearly over. I didn’t do too much this year– I wore my requisite green shirt, and striped green socks, and even drank a holiday themed beer in the evening, however overall the day was relatively low key, as P and I were both busy working on projects, shackled to our respective computers. I’ve mentioned before that my family considers itself “Irish-American.” On my mother’s side my grandfather immigrated from Western Ireland (I believe in the 40s), and my grandmother’s parents were also both from that region of the country. On my father’s side the connection stretches back farther, but the family still takes pride in it’s “Irish-American” roots. As an “Irish-American” St. Patrick’s Day has always been an acknowledged and celebrated part of the spring calendar. Growing up my father was part of an Irish-American club in the town, and I remember many childhood St. Patrick’s Days spent at the club helping to serve corned beef and cabbage dinners to townspeople who came by the hundreds every March 17th. Many of them probably considered themselves “Irish-American” as well but I’m sure others just wanted to join in the fun and celebrate along with their friends and neighbors. We would watch Irish step dancers perform and listen to recordings of Irish pub songs that relied heavily on accordions and fiddles. Everyone in the club was bathed in Kelly Green… shirts, pants, dresses, socks, scarves. Some wore plastic shamrock shaped shot glasses hanging from green Mardi Gras bead necklaces, others wore headbands with cheesy shamrock antenna, and little kids often sported sparkly green shamrock stickers on their cheeks. As far as I was concerned, as a kid, everyone in the world celebrated St. Patrick’s Day. Then in sixth grade I signed up for a youth magazine that had a pen pal section in the back. For several years I often responded to pen pal requests, and I advertised for pen pals as well. I had quite a few, some in the US, but also several from abroad– including one kid I exchanged several letters with from Singapore. He had responded to my pen pal request printed in the magazine, explaining he was of Indian origin and his name was Manuj. In response to the letter he sent I told him a little about myself, and talked about my excitement for St. Patrick’s Day, which was coming a few days later. In the letter I asked him about how he celebrated St. Patrick’s Day, and what people do for the holiday in Singapore. A few weeks passed and I received a letter back that contained shocking information for the sixth grade version of me… “We don’t celebrate St. Patrick’s Day in Singapore, as there are not a lot of Irish people here. Since my family is from India, we have never done anything for St. Patrick’s Day, but it was interesting to hear what your family does.” It was one of those “aha” moments for me that made me realize that other parts of world really are different. After meeting our Irish friend, I’ve had several other “aha” moments about my understanding of “Irish-American” culture, and how it differs from “real Irish” culture– including my name. I think I mentioned this before, but I always thought my first name was a super-uber Irish name, but later realized (and this really shook up my world!) that my name is only popular in Irish-diaspora cultures like the US and Australia, and hardly anyone in Ireland proper has my name because it is a gaelic noun. I think RH had similarly strange “aha” moments (I am assuming, he can correct me if I am wrong) after coming to the US for his graduate studies. Many Americans, particularly in New England which is a large “Irish-American” stronghold, had a lot of stereotypical views of what an “Irish” person was supposed to be like, and RH often didn’t adhere to their expectations. So when U decided to travel to Dublin for St. Patrick’s Day RH was a little worried that U would be disappointed. 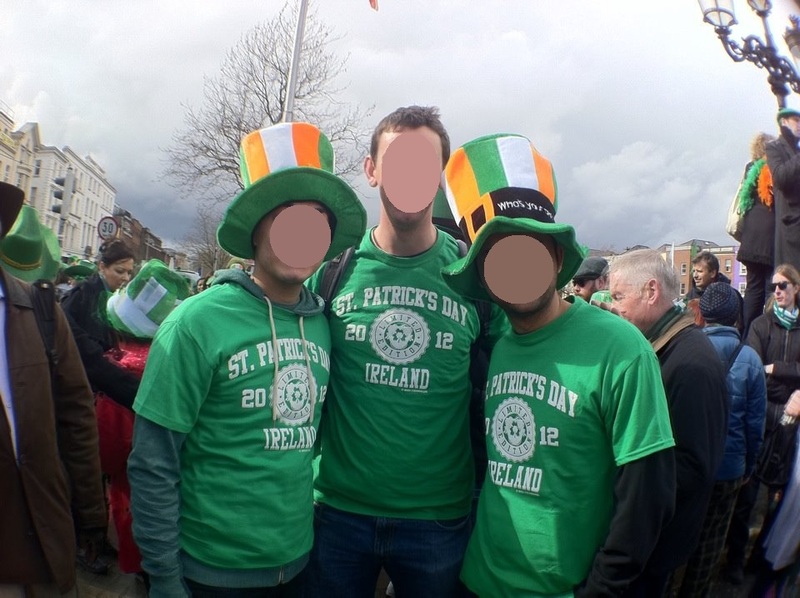 St. Patrick’s Day is often an excuse for people in the US to go a little crazy, drinking green beer and sharing their Irish pride all over the place… but these crazy celebrations are often in Irish-diaspora cities. Dublin has a parade and celebrations, but RH worried that U might expect the biggest St. Patrick’s Day party ever, the granddaddy of them all, so to speak. It seems from the pictures that the festivities were fun, and U had the “authentic” Irish St. Patrick’s Day party he was hoping for. If you are interested in learning more about the creation of “Irish-American” cultural identity NPR had an interesting 45 minute radio program on Tom Ashbrook’s “On Point” the other day called “How the Irish became American” arguing, in part, that “Irish-American” identity was one of the first hyphenated identities in the US. It’s definitely worth a listen. Alas, as of late, I’ve become one of those absentee bloggers. Je suis très désolée. It’s not that I don’t have anything to say, I just sometimes lose the motivation to sit down and put it together in a post. I have a bad habit, during dark chilly New England months, of burying under blankets in the evening and reading good books. Perhaps I was a hibernating creature in another life. So, to transition in to writing a little bit more, I decided to share an amusing story from the weekend. January 15th is P’s western calendar birthday (his Nepali calendar birthday was near the beginning of January, and like every year he didn’t know it was happening until he got a call from his parents one night wishing him a happy birthday) and this year it was also the Nepali holiday of Maghe Sankranti. I’m not totally clear on the details of this specific holiday (although the ever handy Wikipedia gave me a better idea), other than it marks the start of the Nepali month of Magh and the passing of the unlucky month of Poush, and that on this holiday you eat boiled cassava and purple colored sweet potato that can only be found locally at the Vietnamese grocery store. This year, as last year, S-di invited our local crew over to her place for the day. Between S-di, M-dai and his wife’s cooking there was much to be had—the required boiled cassava and sweet potato, sel roti, a giant bowl of homemade ghee, sesame sweets, rice, taarkari, chicken, etc. And as usual, we went to her house thinking that we would only stay for a few hours… and we wound up being there for eight or nine. After our bellies were full, and M-dai, Bhauju (M-dai’s wife), S-di, P and I were settled on the couch under cozy blankets, we spent time chatting and M-dai told a funny story. Anyway, they used to find this foreign teacher really interesting. He was quite different from the rest of them in various ways, but he had this one habit that all of the students found really bizarre—he used to fart in public like it was no big deal. Now one could speculate. Maybe this guy was a bit of a bum, and he would have farted in public anywhere, including in the US. Or maybe the combination of Nepali food, a different altitude, and intestinal bugs continually agitating his GI tract, left him with no choice but to let loose, or else be plague by terrible gas pains (hey, it could happen). Yet it’s also possible that maybe this guy simply thought passing gas wasn’t a big deal in Nepal—burping certainly isn’t, although apparently there is a different feeling about flatulence from the other end—and never thought much about doing it where ever he was, alone or with others. Certainly Westerns fall into this mentality when it comes to clothing while traveling in the “developing world,” myself (formerly) included. Sometimes even the most “culturally interested” or “attuned” just fail to realize things. I used to think that when walking through dirty, dusty streets, or living in a village, it didn’t really matter what you looked like. I’m not really one to get really dressed up in general, but I wouldn’t bring my “nicer” clothes on my study trips to Kenya or India, in part, because I was worried about “ruining” them, but also I just figured there wasn’t really a need to bring them. Even before my time in Kenya was over, I was starting to catch on and dress a little more “East African chic,” but it wasn’t until my embarrassing first clothes buying experience with P’s family in KTM that I really realized that in the “developing world” (and, let’s face it, most of the rest of the world outside of America) clothing is more formalized than back home. When you go out, you dress up, period—whether it’s for school, going to a party, going to a friend’s place, going for dinner, going to the market. It’s simply not acceptable to show up in a shabby pair of shorts and a dusty t-shirt, even if you sit next to a goat on the minibus you take to your friend’s house! So maybe this guy thought the same way about farting—hey, it’s the “developing world,” people burp, I’m not in America where they have social etiquette rules about this, I feel gassy, and I’m going to let it go. According to M-dai this guy would fart all the time, including while he was standing in front of his class, and the students just couldn’t believe it. So from this early ambassador to American culture, the young M-dai thought that in America it was acceptable to fart at any time, that there were no social taboos in the US about doing so in public. Bill Bryson wrote a book of funny essays on returning to the US with his family after having lived abroad in England for twenty years called “I’m a Stranger Here Myself.” It has about 70 mini-essays that cover different bits of Americana such as road trips and staying in motels to junk food and drive-in movies. I read the book about ten years ago, but I still remember laughing out loud at some of his reflections on things. However later, as the family arrived at the drive-in he laments, “Almost at once I began to remember why drive-ins went into such a precipitate decline [there are very few left in the US today]. To begin with, it is not remotely comfortable to sit in a car to watch a movie. If you are in the driver’s seat, you have a steering wheel in your lap the whole time. If you are in the back, you can’t really see at all. Unless you had the foresight to clean the windshield before you set off, you will be watching the picture through a smear of squashed bugs and road dirt. The sound quality from the little speakers is always appalling…[and] in a place like New England, the evenings invariably turn cool, so you shut the car windows to keep warm and then spend the rest of the evening wiping condensations from the inside of the windshield with the back of your arm.” Invariably his little outing was a disaster and the family drove home vowing to never go to the drive-in again. But I have a soft spot for drive-in movie theaters and when I drive by old abandoned ones it always makes me sad. 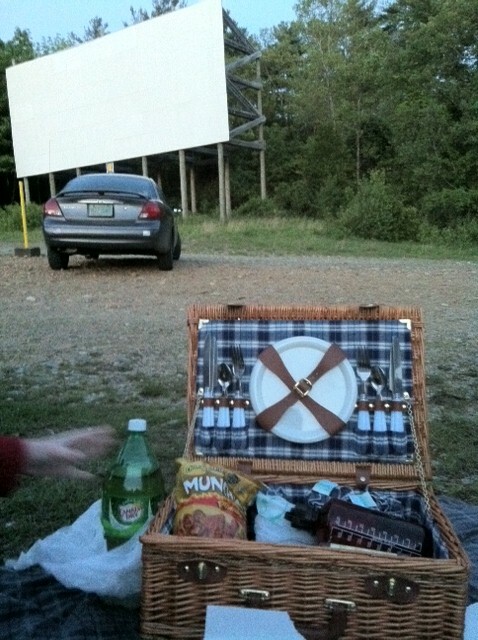 We had a great drive-in near the town where I grew up. I vaguely remember going with my parents a few times as a kid, but it wasn’t until high school that I realized just how fun they could be. Once you turn 16, and get your driver’s licence it is like a whole new world opens up for you. I remember a few times a summer I would borrow my family’s minivan, load it up with a bunch of my friends, stock up on snacks and drinks and go to the drive-in. Since the movies didn’t start until it grew dark enough to see the screen (around 9 or 9:30) and that particular movie theater used to do a triple feature, it promised a late evening. They also used to raffle off free pizzas in between the movie showings. It was awesome. So when we moved to our new place in New England, and discovered a drive-in movie theater about fifteen minutes away, I was keen on introducing P to this bit of American culture. We have now lived here for four years, and each summer we go a handful of times, usually bringing new people along to experience the drive-in. The theater near us seems to be thriving. It has three screens and shows six movies a night (two on each screen). It charges $20 a carload of people, and you can watch any two movies (switching screens after the first showing if you want). Although the speaker poles are still in the field, now all the sound is broadcast through local radio frequencies. We pack the car with blankets and a picnic basket full of snacks (last night we had pizza, beer, and spicy chips from the Indian grocery store). You roll down the windows of the car and turn up the radio, and sit back to watch. Last night we went with S-di and M-dai, who had never been before. Since (as Bryson pointed out) its tough to see from the back of the car, we usually spread out blankets next to the car so that everyone can see. It was pretty chilly, but we wrapped up in sweatshirts and blankets and washed down the pizza with beers while watching a silly movie. We were going to stay for the second showing but we were a bit tired and cold, and since we only paid $20 for the car you don’t feel bad if you don’t stay for the whole double feature (its also a great place to see movies that you know probably won’t be good, but you still want to see anyway, like what we saw last night). I hope drive-ins survive until I have kids. I’d love to take them. Bring them in their pajamas and let them stretch out and watch movies until they fall asleep, bellies full of pizza, and pack them into the car for the ride home. P came back from Nepal on Saturday (hurray! ), and brought lots of wedding related goodies, which I’ll blog about at another time. However instead I thought I’d take a few minutes to talk about grilled cheese sandwiches. Cheese is not very high on the Asian list of tasty foods (South or East, unless you count all the milk-cheese related products consumed in Mongolia, but those cheeses are decidedly a whole different category). Although I think P has grown an appreciation for (Western style) cheese over time having been exposed to lots of varities of cheese through me and my family (hard cheese, soft cheese, moldy cheese, smelly cheese– give me a cheese platter as an hors d’oeuvre any day! ), he is still not big into cheese sauces, mac and cheese, or cheese as a main course. Hence grilled cheese sandwiches (to him) just sound a bit unfilling and perhaps unappetizing. I haven’t had a grilled cheese in ages, so I’m pretty excited. I guess that is one of the perks of living with someone from a different culture– since you eat a lot of different kinds of foods something a local would consider relatively mundane and boring all of a sudden becomes exciting and different. It started while we were taking Hindi language classes in Mussorie, Uttaranchal. We would spend the morning walking up the steep (crazy steep!) hill station roads to our language class, spend the entire morning working on language acquisition skills, and then head back down the hill to the guest house for lunch. It was the end of the rainy season, and it was often pouring and damp, and heavy rain frequently knocked out the electricity. “Cheese toast” (and soup) day was enough of a pick-me-up to send us careening down the slippery hill after class fighting to be the first person in line for the grilled cheese and tomato sandwiches. After a while we found that “cheese toast” was often found on various menus as we traveled across India, particularly in touristy cafes (not that we ate in those cafes all the time– but every now and then). Other Westernized dishes didn’t come out tasting as good– pasta in red sauce, mac and cheese, pizza, but “cheese toast” really hit the spot when the stomach needed a small reminder of home. I can’t remember the last time I had a grilled cheese sandwich. I hardly ever ate them in the US before I went to India and used it as my “I need a taste from home” meal. But I’m pretty excited to have one tonight. MMMM… my mouth is watering just thinking about it! I was part of the generation that grew up watching Seinfeld and Seinfeld re-runs. I even had a psychology teacher my senior year of high school who showed us Seinfeld clips to highlight various neuroses. To this day I can’t say “vegetable lasagna” without thinking about Elaine arguing with Puddy on an airplane while a poor passenger bystander is caught in between them. Once his meal arrives—a “vegetable lasagna”—Elaine mocks the passenger and calls him “vegetable lasagna” the rest of the flight. There are lots of stupid random things from life that can trigger a Seinfeld memory. Making use of my time while P is out of town, I spent one weekend putting together and addressing our wedding invitations. We are keeping with the “red wedding/white wedding” theme, and as such we have two invitation cards—a red one with the Nepali details and a white with the American details. My sister designed them. Anyway, I spent the weekend putting the two invitation cards along with the response card, information card, and red addressed and stamped response envelope into a black invitation folder, tying it with a red ribbon, putting the whole bundle into a larger red envelope, addressing, stamping, and finally licking the envelope closed. Of course, after a while I started to think about the Seinfeld character George Constanza and how he was engaged for a period of time to Susan, whom he didn’t really want to be married to. His character in particular was super cheap and ornery, so he insisted they buy the cheapest wedding invitations at the store—for those of you who also watched Seinfeld you know the rest from the episode “The Invitations”—Susan spent an evening making out invitations, licking the back of the envelopes, and was eventually poisoned by the toxic glue and died. The show’s main characters were known for being self-absorbed and unaffected, and thus dealt with Susan’s death by shrugging their shoulders and saying, “ehh.” Whenever I lick a bunch of envelopes—particularly when sending holiday cards in December, I can’t help but think about that episode and giggle a little. So I successfully licked all my invitations without incident. I guess I’m one step closer. On a separate note, I had an Indian undergraduate in my office not long after completing this task. He had to fill out some paperwork and mail it in somewhere. I gave him a blank envelope from my desk, but he said he hated licking envelopes, so he stuffed it and I sealed it for him. I said I had licked a bunch of envelopes recently, so what was one more? And I couldn’t help myself—I asked, “Do you know the show Seinfeld?” He looked at me blankly, so I decided to fill him in on a little slice of Americana… and explained the episode to him. Perhaps now he just thinks his international student advisor is weird?